Please refer to our stock # 1852 when inquiring. 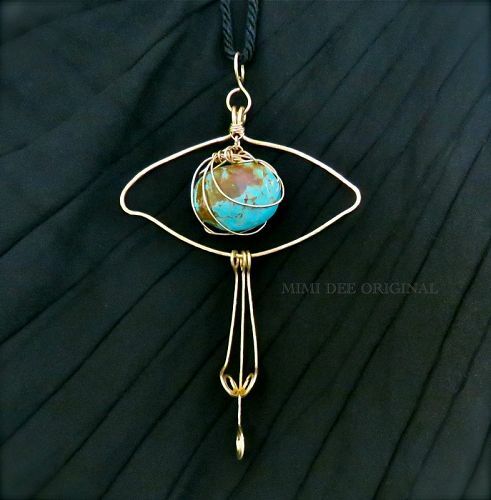 Signed studio original hand hammered brass bold kinetic protective eye pendant necklace with spiral dangles and an added bold turquoise dangle, was made in a USA studio in the in the Mid Century Modernist or Arts and Crafts tradition by this self directed metalart maker and signed Mimi Dee - Handmade. The multi cultural ethnographic evil eye protection motif, used in jewelry by the ancient Romans, Asian Dzi, Victorian, Latin American countries and continuously through out the middle east was hand shaped forged by this maker. Looking at 2000 year old examples, the reason for the blue color was thought to protect children against the not usually occurring blue eyes in the Mediterranean countries! *Stone: Bold turquoise approx. 23 grams at 1 1/4" x 1 3/4" - with beautiful siena color mineral veining throughout and is encased in 14K gf gold. *Brass: milled in USA - not for children under 12yo as noted by the millers. *Hand hammered - notice the asymmetrical marks made by these hands. Every square millimeter of this American made metal was shaped by hand here. No pre fab parts! *Black Cord Necklace: adjustable up to 45" or can be worn on your own chain. This signed studio metalwork jewelry artist who also paints oils / acrylics, has made fiber art to wear garments in the past and does not duplicate, has exhibited in various juried art shows, more recently since the 90s.